Preheat the oven to 350°F. Line 2 baking sheets with parchment paper or silicone baking mats and set aside. In a microwave safe bowl, heat the chocolate at 50% power, stirring every 30 seconds until the chocolate is almost melted. Continue stirring it until it is completely melted. Whisk in the sweetened condensed milk until well combined. Whisk in the egg whites. 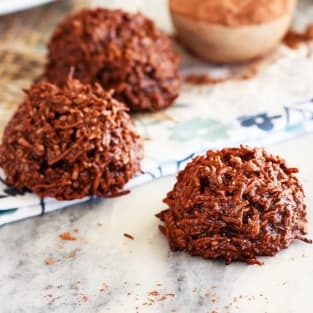 In a large bowl, stir together the coconut and cocoa powder. Add the chocolate mixture and stir until well combined. Form the mixture into 2-tablespoon-size balls and place them on the prepared baking sheets. It will be very sticky so a cookie scoop is the easiest way to do this. Bake the macaroons for 10-12 minutes. Let them cool on the baking sheet for 5 minutes before removing them to a wire rack to cool completely. Store in an airtight container at room temperature for up to 5 days. Source: Adapted from my Bird’s Nest Cookies.